Prodigy 2.0 Leggett & Platt Adjustable Bed Base Split King Wireless Massage Bluetooth Head Tilt Reviews 2019! After doing a lot of research and testing we found that this massager bed is the best price performance bed base. The wall hugger feature is supposed to move the mattress back as you raise the back otherwise you will be reaching back to get something off your nightstand. Unfortunately, our mattress (Latex) is 12+ inches. So the best case is you will be a foot further forward. The wall hugger feature helps but in the sitting up position the end table is still back behind you. Without the wall hugger feature, it would be even further. The remote will not allow you to control all the options (wave massage) so you will need to iOS or Android App. We had difficulty pairing and talked with support. You need to disconnect the power brick (and remove the backup batteries which are for controlling this best massage bed when there is a power failure) and then reconnect which then gives you 2 minutes to Bluetooth pair. If you are using an iPad you will need to search and download the iPhone App which works on the iPad. The wave massage can only be started from the App as the handheld control will just vibrate back and legs. You also get 2 additional preset positions you can set with the App. Since this is a split CA king, this is really two beds with two Bluetooth devices. The iPad App worked but the Android App has some issues depending on your device. Some Android devices work fine but others have a problem. In discussions with Leggett & Platt they are aware of the issue and working on a fix. We were hoping to use one inexpensive tablet (ACER 11 inch) to control the bed but it did not work. There are four adjustable legs so you can raise or lower the base to a height that is right for you. There are LED lights under the frame that you can turn on/off with the remote. The handheld remote doesn’t have a charging base so you will be replacing 3 AAA batteries (not sure how long they will last). Under the bed on the side are the 4 USB charging ports. Since this is now a moving bed as opposed to one that just lies flat, you will need to pay attention to clearances for the bed to move. We use to keep a comforter at the foot of the bed but now that the foot can move up, the comforter can fall down and fill the gap and interfere with the movement. Likewise, you need to ensure that the bed does not move forward and have the top of the base catch the headboard on the way up as this could damage the movement (this happened to me). Originally they installed our base over the slats and didn’t realize that the slats were carrying some of the load. This lets the bed slide and we wound up catching the head under the headboard and doing some damage. L&P was kind enough to give us a replacement unit. With the slats removed and sitting on the 4 feet, it has not moved. Someone asked about the pillow articulation which is new for the L&P Prodigy 2.0 2016. Before this model, there was a back adjustment and a foot adjustment. When the back was raised you were still leaning slightly back and would need pillows to move your head more vertical for watching TV and reading. With this massage bed model, they had a third movement called pillow which moves the top portion of the base forward to bring the pillow more forward. I’ve attached some pictures with the back elevated and then applied the pillow articulation. With the pillow fully forward the top portion of the bed is now vertical. Most mattresses are pretty thick so when that is placed on the base it will curve a little so it won’t be 100% but that is expected. 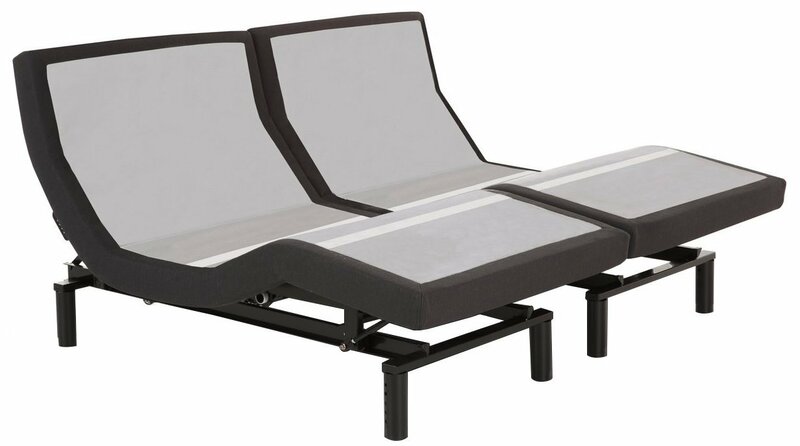 So overall we are happy with this Prodigy 2.0 Leggett & Platt Adjustable Bed Base. The only cons is the wall hugger not fully correcting for the bed movement. It was the biggest disappointment and having to work out faced some problems with the Bluetooth app.